Our major occupation these days is chasing wind, not too much mind you, not too little, but just the right amount and from the right direction. We left Bahia Del Sol seventeen days ago much chastened about the Papagayo and the Tehuanapec, gusty winds north and south of us. Our plan was to squeeze between these major winds, avoiding the crazy currents meandering around these parts, using the favorable ones, staying in the northern tradewinds and make a break for the Marquesas when it seemed right. We fashioned a course, subject to changing conditions and into the chart plotter it went. That’s about the only thing that went according to plan. After the first two days in good wind but horrible sea state we sailed into a hole. We get grib files these days on our satphone and it shows a very slow passage for Escape Velocity. We’re coming to grips with our new rig and honing our light air techniques but the latest grib file shows another windless hole dead ahead. But then they’ve been wrong before. We’ve had at least two squalls a day and yesterday evening three popped up surrounding us. 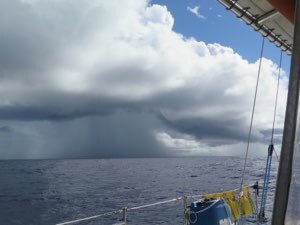 We sailed right between them, following their course on radar, and the squall coming up behind us moved off with hardly a drop of rain. It’s disturbing how quickly they form and I’ve read that they’re usually stationary but you can’t prove that by me. With all of these squalls popping up so quickly we aren’t inclined to keep lots of sail up which exacerbates the light wind problem. So everyday is different but somehow the same. We discuss what sail, course, or trim changes we might make. We gaze out over the bright blue Pacific from what looks like the bottom of a deep twelve mile wide bowl, so that it feels like we’re always sailing uphill. Nothing interrupts this view except the ever changing cloud formations on the periphery. In the meantime the weather has been beautiful, the boobies have left, cleanup in aisle two! The SSB radio signals are getting weaker as we approach the halfway waypoint in the middle of nowhere, but a light signal from our friends on Macushla in the Pearls perked up morale. We know the Mexican Puddle Jumper boats are heading down this way so we might actually see another boat someday. You never know.